Well built, sturdy, durable, and comfortable bike. Easy to assemble, and it comes 95% assembled. 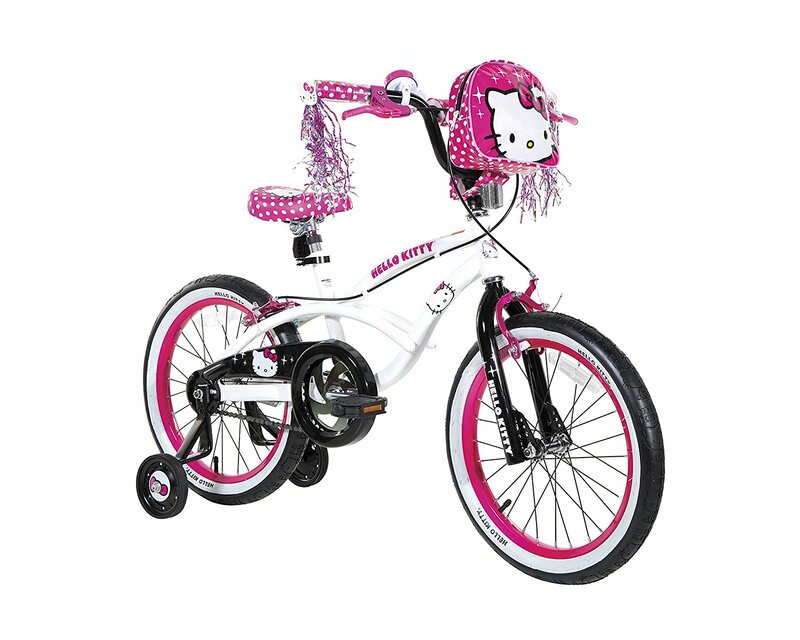 Safety features include a fully enclosed chain guard, safety grips, and heavy-duty training wheels. The combination of hand and coaster brakes provide many options to learn how to stop the bike. A quick release seat post makes it easy to adjust the height of the seat. Include water bottle (BPA free) with the holder, bell, reflectors, assembly tools, kickstand, and the training wheels. It is available in six colors (Blue, Red, Orange, Green, White, and Pink) and 12-14-16-18 inch wheel sizes. Handlebars, Pedals, and training wheels need some fine-tuning. 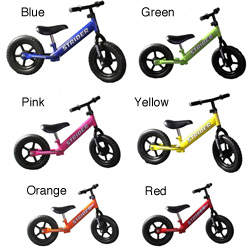 This is the summary of consumer reviews for RoyalBaby BMX Freestyle Kid's Bike, 12-14-16-18 inch wheels, six colors available. The BoolPool rating for this product is Good, with 4.00 stars, and the price range is $89.99-$153.57. Biking is a great way to explore and stay healthy. 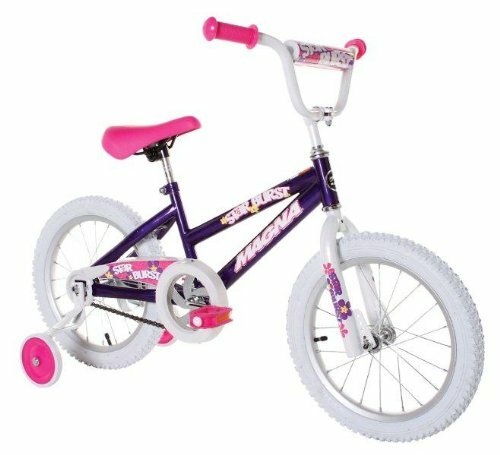 RoyalBaby BMX Freestyle Kid's Bike is a well built, sturdy, durable, and comfortable bike for boys and girls of age 3-8 years old. This one-speed bike has a sturdy steel frame and wide knobby tires. The combination of hand and coaster brakes provide many options to learn how to stop the bike. A quick release seat post makes it easy to adjust the height of the seat. This bike is easy to assemble, and it comes 95% assembled. 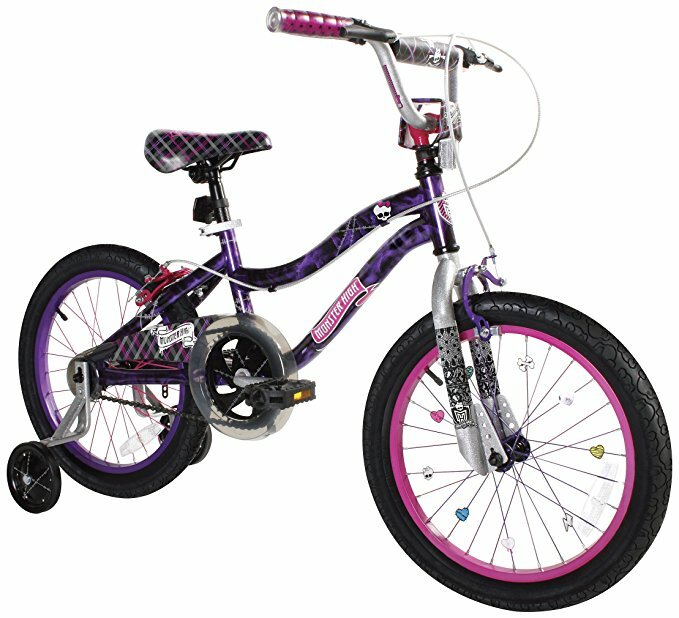 Other safety features include a fully enclosed chain guard, safety grips, and heavy-duty training wheels. 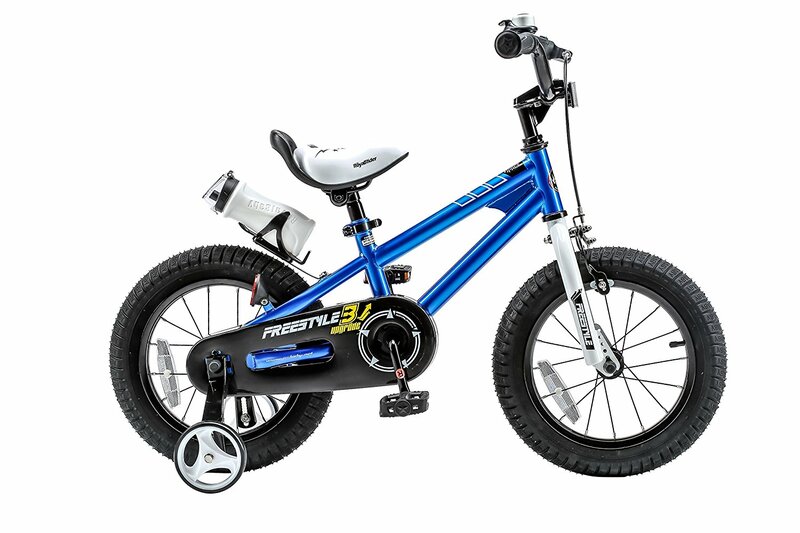 This bike includes water bottle (BPA free) with the holder, bell, reflectors, assembly tools, kickstand, and the training wheels. It is available in six colors (Blue, Red, Orange, Green, White, and Pink) and 12-14-16-18 inch wheel sizes. 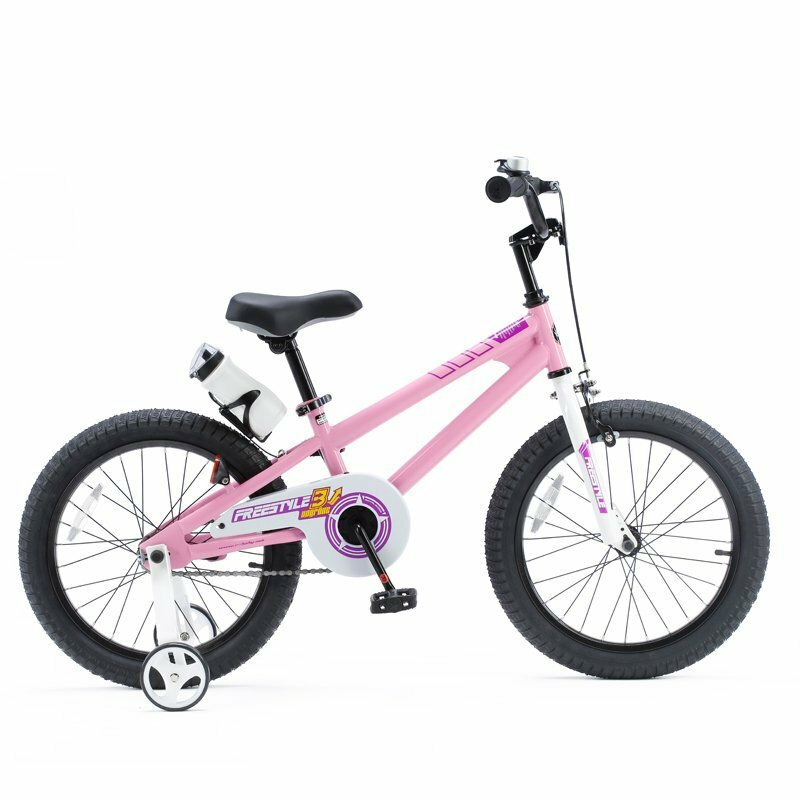 Users love RoyalBaby BMX Freestyle Bike as it is well-built and sturdy. This bike comes with a kickstand, training wheels, water bottle, and rack. The handlebar can be adjusted up, down, forward, backward. The seat can be adjusted so that the kids can share the bike. 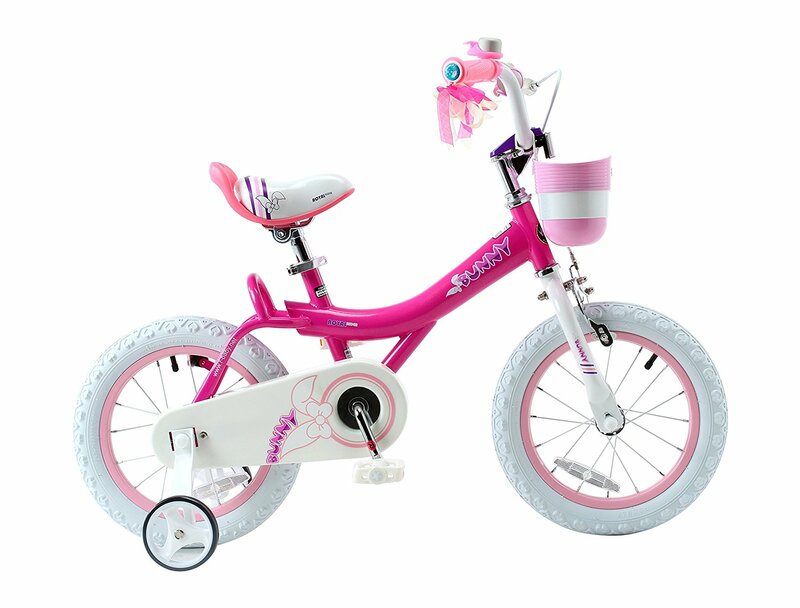 The bike is partially assembled and easy to attach handlebar, seat, training wheels, and pedals as the instructions are clear. Kids love the way it rides. However, a few found that the RoyalBaby BMX Freestyle Kid's Bike is heavy. The parts (handlebars, pedals, and training wheels) need some fine-tuning. The quality of the water bottle is low. The water bottle holder does not fit well between the seat and a rear tire. The full water bottle can weigh the water bottle holder down and touch the tire. 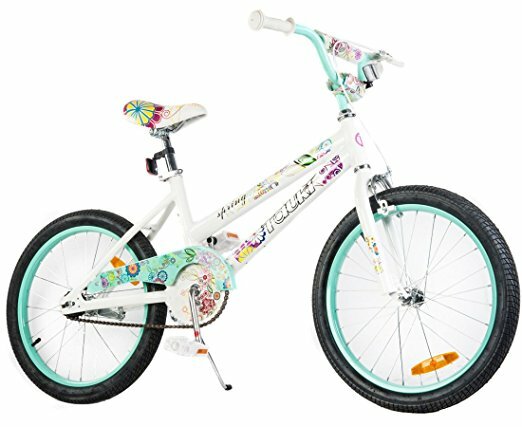 Overall, RoyalBaby BMX Freestyle Kid's Bike is a cool bike, any child would love to ride. Available in six colors Blue, Red, Orange, Green, White, and Pink. The handlebar can be adjusted up/down forward/backward. then checked handle bar, seat, training wheels, etc. the tires needed air but they seemed true (front and back). after reading reviews i'll install lock washers on rear bolts (for training wheels) as the training wheels do move a bit which probably can loosen bolts over time. box arrived in pretty good condition and everything seemed new from factory. One issue with the 14'' is it came with the white vinyl seat with black handle on back of seat. Minus the handle seat we're very happy with it. i liked that the handle bar could be adjusted up/down forward/backward. The replacement arrived in a totally banged up box and this one had a handle that'd move no matter how hard I tried to tightened the bolt! The first bike we received had a tire that was leaking right out of the box. Everything fits and is made nicely. I took a hacksaw and removed the handle. The bike is well built and sturdy. This bike is heavy. No issues putting it together. Heavy rolling resistance initially, improved with time. Received the bike yesterday and it's great, it's heavy but solid and well built. This's a fine first bike but it's quite astonishingly heavy. It's heavy for an adult (think about all those times you e had to carry your kid's bike home when he's too tired to ride), and it's extremely heavy for a child. The bike is well balanced. The bike is ridiculously overbuilt and heavy. This bike is great, again well built and very solid. The bike is quite heavy, but she's able to pick it up just fine when she falls over. 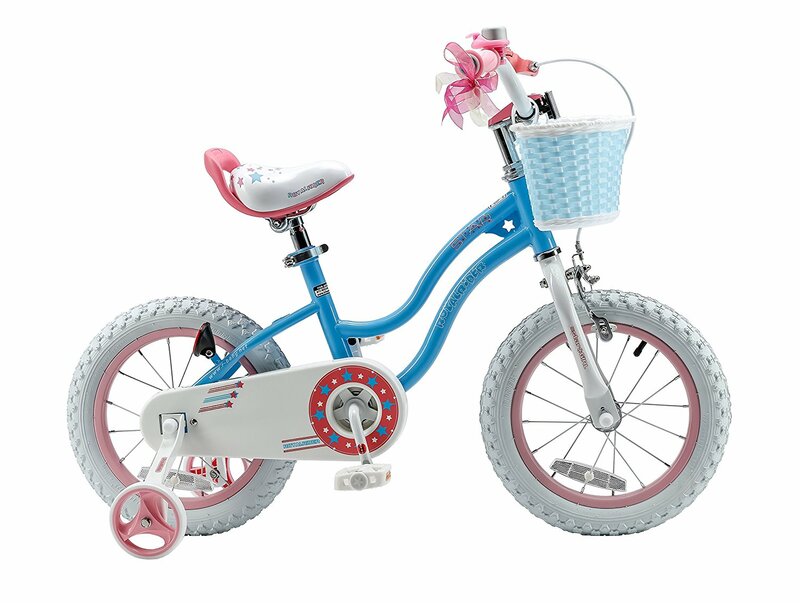 This bike is partially assembled and easy to attach handlebar, seat, training wheels, and pedals. Easy instructions. It arrived on time, well packaged, and already mostly assembled. It was already partially assembled so it was pretty much just attaching the handlebar, seat, training wheels and pedals. Easy instructions, and very intuitive. Also no instructions for installing the 1) Bell, 2) back light reflector and 3) front reflector - use the picture on amazon to figure it out, or it took me about 10 minutes looking around the bike without the picture. It'd take a pro less than 10 minutes to assemble. It's held quite well so far and was easy to put together as it was mostly assembled already. Looked like it was easy to assemble (I caught Santa putting it together Christmas Eve) and I love that it comes with all the extras that you'd want on a bike like a water bottle, a bell, and the training wheels. It all came together very well and he loves his new bike!. The reason I'm giving it 2 stars is because the instructions are terrible for assembling. Love it comes with a kickstand and training wheels. No matter how hard tighten the screws, different areas loosen up including the handlebars and the training wheels. I love that just comes with a kickstand and training wheels because I hope my daughter gains enough confidence to ride without training wheels on this bike. My daughter is learning how to ride without the training wheels, so I didn't put the training wheels on. Overall, I'd give this bike 4.5 starts (rounding up to 5 stars) The loose training wheel bolts aren't a big enough issue to drop this review down fully 1 star. First, it arrived without pedals, training wheels, tools, instructions, water bottle, bell. 1) As other's have mentioned, the training wheel bolts like to come loose. Found out the wheel hardly moving made bike's heavy to ride. He got on it and was riding immediately without training wheels. I'm saying this as she's riding it without the training wheels..
Training wheels and pedals are essential. First off, no matter how hard we tighten the screws, different areas loosen up including the handle bars and the training wheels. Kids love the way it rides. Love the adjustable seat, so that friends can ride. My son LOVES this thing and it came basically fully assembled. We took the bike out and my son went for a ride. The quality is just not good, the bicycle isn't comfortable and I was simply too scared to let my son ride such a poor quality bike. The training wheels were a little hard to get on tight enough and as a result they tend to slip a little while my son is riding his bike. Had trouble to install the pedals. Not sure if we can tighten better or needs a new pedal. None of these issues were due to assembly, which only requires attachment of the handlebars, pedals, and training wheels.